Shri V.P. Nandakumar, MD & CEO of Manappuram Finance Ltd. The festival season is on. I take this opportunity to wish you all a very happy Onam. I also want to thank you for the great response you gave to our last edition. Especially the interview with Dr. Thomas Nechupadam met with some great reviews. This edition we have our main article on Vaidyavachaspathy N.K. Padmanabhan Vaidyar of Nupal Pharma. Padmanabhan Vaidyar passed away on the 25th of August, 2013. He was one of the leading Ayurveda practitioners in India. 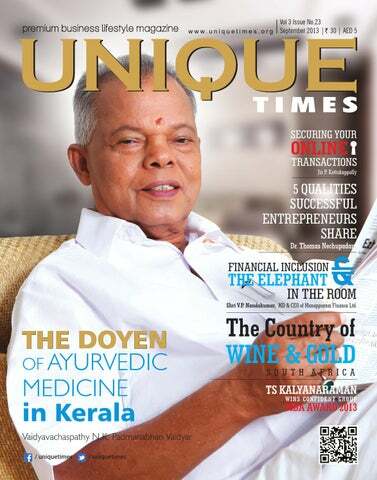 Our early readers will certainly remember his articles on Ayurveda treatments and theory in our magazine. I express by deep grief on behalf of the entire Unique Times on his demise. He was certainly one human being whose lose cannot be replaced. 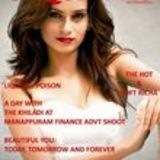 In our regular articles we have articles by Mr. V P Nandakumar and Jiz P Kottukappally. We also have the sections on entrepreneurship by Dr. Thomas. Among other stories, the review on the 2013 Fiat Linea stands out. Enjoy your reading. RNI Reg. No: KERENG/2011/42633 * All rights reserved worldwide. Reproduction in any manner without permission of proprietors is prohibited. 15 Shri V.P. Nandakumar is the MD & CEO of Manappuram Finance Ltd.
r. Dinesh K. Sarraf will be the new chairman and managing director of Oil and Natural Gas Corp (ONGC), which just happens to be India’s most profitable company. Mr. Sarraf, is currently the managing director of ONGC’s overseas arm, ONGC Videsh Ltd, has been selected to replace Sudhir Vasudeva in the end of February next year. He was selected from among four candidates. Mr. Sarraf was director of finance of ONGC before moving to OVL in September, 2011. He transformed the company into an aggressive overseas firm, stitching four deals worth over $11 billion in the past one year. As the head of ONGC, his immediate task would be to raise the stagnant oil and gas output and aggressively look for more reserves. he Land Acquisition Bill which was passed by the Lok Sabha may likely push up the cost of acquiring land by up to 3.5 times, making the industrial projects unviable and raising the overall costs in the economy according to India Inc. The Confederation of Indian Industry (CII) said that it has always emphasized on the need to streamline the land acquisition process in order to boost manufacturing and promote job creation in the industry. According to S Gopalakrishnan, the president of Industry body CII at a time when major projects are stalled and India’s global competitiveness is eroding, a more facilitative land acquisition process would have helped long term growth and restore the investor sentiments. he property consultancy firm Jones Lang LaSalle (JLL) has appointed Mr. Juggy Marwaha as it’s managing director for their South India operation. Mr. Marwaha will be taking responsibility for the company’s operations in South India and will work towards helping the business grow for the firm in the region. “(Mr.Marwaha) will bring into play his established reputation as a commercial real estate expert on the South Indian market,” said Santhosh Kumar, CEO of operations at JLL India. Mr. Kumar commented that “with (Mr. Marwaha’s) experience in working closely with leading global IT and BFSI clients, he is appropriately positioned to play an impactful role in fortifying and expanding some of the firm’s business location. o curtail exposure to automobile loans, the State Bank of India which happens to be the country’s largest public sector bank, tightened the criteria for the disbursal of such loans. The bank has raised the minimum salary requirement for the loan to be 6 lakh rupees per annum from 2.5 lakh (net) earlier. According to the bank’s website, the lender is currently offering car loans at an interest rate of 10.45 percent. An increase in distressed loans, and the provisions to guard against them, is likely to eat into the profits of State Bank of India this financial year and also hurt its smaller state- run rivals. SBI is the largest financer to Maruti Suzuki India Ltd and has a 26% share in Maruti’s volumes. Maruti also has the largest number of budget cars such as Alto, A-Star and WagonR. A tight disbursal therefore is going to push these consumers towards other lenders. arclays downgraded select state owned banks and finance companies, citing a slowing economy and unpredictable monetary policy responses. The brokerage expects asset quality to remain problematic as the stress in economy is seen extending beyond the SME and mid-corporate segments to the large corporate segment. The research downgraded Bank of Baroda Ltd, Bank of India Ltd and Punjab National Bank Ltd to “underweight” from “equal weight.” Among non-banking finance companies, LIC Housing Finance Ltd was cut to “equal weight” from “overweight”, while Rural Electrification Corporation ltd was downgraded to “underweight” from “equal weight”. LIC Housing was up by 2.1 %, while REC was down by 1.1%. Resignation from One finds limits by pushing them. he Multi Commodity Exchange (MCX) chairman Venkat Chary and five other directors on the bourse’s board have quit following the implementation of new guidelines including those that bar any person over 70 years of age to hold a board position. While Mr. Chary and C.M. Maniar, who was a Forward Markets commission approved independent director on MCX, quit due to the age guideline, former managing director Lambertus Rutten and independent director P. R. Barpande resigned citing pre-occupations, MCX said in a filing to the stock exchanges. This development came about on the heels of NSEL defaulting on the second payout for settling 5,600 crore rupee dues after it suspended trade on July 31st following government’s direction in the wake of violation of certain rules. he Financial services provider India Infoline Finance Ltd (IIFL), has filed draft documents with market regulator Sebi to raise up to 1,050 crore through non-convertible debentures (NCDs). According to the draft prospectus filed by the company “public Issue by IIFL, of secured redeemable NCDs of face value of 1,000 rupees each, aggregating up to 5,250 million rupees, with an option to retain over subscription up to 5,250 million aggregating to a total of up to 10,500 million,” The proceeds from the issue would be utilized by IIFL for financing activities including lending and investments. Besides, the funds would be used to repay existing loans and funding working capital requirements. The lead managers to the issue are Axis Capital, India Infoline, Trust Investment Advisors, IDBI Capital Market Services, RR Investors Capital Services, Karvy Investor Services and SMC Capitals. t’s another high profile exit from Infosys as Ashok Vemuri, the director and head of Americas and global head of manufacturing and engineering services has resigned. Mr. Vemuri, who was with Infosys for over 15 years, was the highest paid Indian executive. As Ashok Vemuri, has decided to take his leave, Sanjay Jalona who is currently the regional head for manufacturing in North America will be taking over as the global head of manufacturing of Infosys. Mr. Vemuri has been widely considered to be a contender for the top job at Infosys. His resignation came days after Infosys vice president and financial services head for the Americas, Sudhir Chaturvedi, put in his papers. here were swift responses from the Swiss food company nestle and French rival Danone to Beijing’s announcement that it was investigating possible price fixing of instant milk formulas are textbook examples of how firms should deal with such crises in China according to the executives and consultants. Just a day after the official Chinese media reported the top economic planning agency had launched the probe into six firms, including Nestle and Danone, the two companies said that they would be cutting prices on some of their instant milk products. Once the fact that the companies were the subject of investigation became public, they responded quickly before negative reports were circulated onto the Chinese social media which could harm reputations and sales. wo Sahara Group firms and their chief Subrata Roy, are facing contempt proceedings for alleged non-refund of around 24,000 crores rupees o investors according to the Supreme Court. A senior advocate Ram Jethmalani told a bench headed by Justice K.S. Radhakrishnan that “the contempt proceedings are not a substitute to the execution proceedings, initiated in a money suit to enforce a decree.” The Sahara group replied in the negative when asked by the bench as to whether they seek a review of thei r judgment. Mr. Jethmalani said that “proper inquiry take place” since he has paid substantial amount back to the investors and if it happens to be that it is found that this is not true, to then send them to jail. he Hewlett- Packard Co has appointed three big name directors, including the former Microsoft Corp software chief Raymond Ozzie and former McDonald’s Microsoft Corp software chief Raymond Ozzie and former McDonald’s Corp CEO James Skinner to strengthen it’s board. The PC maker, which has been attempting to strengthen its board after years of leadership calamities, said that it was still searching for more directors. It is also looking for a permanent non-executive chairman to succeed Ralph Whitworth, who holds the position on an interim basis. The recently appointed has increased the size of HP’s board to 12 from nine. The appointment of well known directors to HP’s board was an effort to answer the shareholder’s longstanding cries for a stronger board. n IMF study has observed that the regulation of securities market in India can be improved with better information sharing and policy coordination between various financial sector regulators like Semi and RBI. The study also found out that the securities and derivatives clearing and settlement systems in India "is prudent, the operational reliability is high and the regulation and oversight functions are effective". In the study it is mentioned that "The overall quality of the oversight and supervision on payment and securities clearing and settlement systems would be enhanced if the RBI and SEBI met regularly on a technical and higher level, and had formal arrangements for information sharing and policy coordination,"
tate-owned Housing and Urban Development Corporation (HUDCO) has asked for Sebi's approval to raise up to Rs. 5,000 crore through tax-free bonds. Hudco in the application said it would issue "tax free bonds of face value of Rs. 1,000 each in the nature of secured, redeemable, nonconvertible debentures, issued at par in one or more tranches for an amount aggregating up to Rs. 5,000 crore". The fund will be uded towards lending, working capital requirements and improving resource base. Axis Capital, Edelweiss Financial Services, HDFC Bank, Karvy Investor Services and RR Investors Capital Services are the lead managers to Hudco's proposed issue. he apex bank of India, the Reserve Bank asked all banks to link the disbursal of home loans to stages of construction of the property to protect the interests of buyers and contain the failure of innovative housing financing schemes. In a statement "In view of the higher risks associated with such lump-sum disbursal of sanctioned housing loans and customer suitability issues, banks are advised that disbursal of housing loans sanctioned to individuals should be closely linked to the stages of construction of the housing projects; an RBI notification said. The notification follows the introduction by some banks of "innovative housing loan schemes" in association with developers/builders, where upfront disbursal of housing loans is made to builders without being linked to the various stages of construction. istory shows that whenever Germany prospered, the rest of the Europe also prospered. This link between Germany and Euro zone is now under questioning as the country is now surging past its neighbours. Even though Berlin is financially supporting the struggling members in the Euro zone in the last few years, the economic crisis has corroded commercial ties between Germany and the rest of Europe. Countries like Italy and Spain no longer have the purchasing power they once did, and they trade less with Germany because of it. Stefano Micossi, director general of Assonime, an Italian business group and research organization said â&#x20AC;&#x153;Germany is less willing to play ball Rather than pulling together, he said, European leaders have been "falling back to mutual mistrust and national solutions." A company's profit divided by its number of common outstanding shares. If a company earning $2 million in one year had 2 million common shares of stock outstanding, its EPS would be $1 per share. In calculating EPS, the company often uses a weighted average of shares outstanding over the reporting term. The one-year (historical or trailing) EPS growth rate is calculated as the percentage change in earnings per share. The prospective EPS growth rate is calculated as the percentage change in this year's earnings and the consensus forecast earnings for next year. A plan to boost the economy and achieve positive effects like increased job creation, jumpstart frozen credit markets, restore consumer spending etc. through the use of fiscal policy like government spending and tax measures. This program is controversial because many economists disagree on the stimulus multiplier. The expenditure is simulative if the multiplier is greater than 1.0 (extra government spending causes add on spending by consumers). However, many economists think that at best, the multiplier is 1.0 (simple replacement of spending that would already occur) and at worst less then 1.0 (government spending focused on less productive targets than consumers would choose). Return on equity (ROE) Indicator of profitability. Determined by dividing net income for the past 12 months by common stockholder equity (adjusted for stock splits). Result is shown as a percentage. Investors use ROE as a measure of how a company is using its money. ROE may be decomposed into return on assets (ROA) multiplied by financial leverage (total assets/total equity). Value stock fund A mutual fund that emphasizes stocks of companies whose growth opportunities are generally regarded as subpar by the market. A value stock company often pays regular dividend income to shareholders and sells at relatively low prices in relation to its earnings or book value. Shri V.P. Nandakumar is the MD & CEO of Manappuram Finance Ltd. THE ELEPHANT How is it, then, that gold loans never find mention in the discourse around financial inclusion? Quite simply, it’s because gold loans are the elephant in the room no one wants to see. because gold loans are the elephant in the room no one wants to see. rates charged by local moneylenders are forced down, a direct outcome of the increased competition sparked off by the arrival of an organised player. It actually benefits the poor who, to this day, depend on these moneylenders. Win-win From the point of view of the lender, high rates of repayment keep a check on loan losses and ensure there’s no erosion of capital. When gold loans are delivered through a low-cost model—as pioneered by the gold loan NBFCs—there’s also reasonable profits to be made. The upshot is that gold loans can be used to advance inclusion without need for explicit subsidies from the government, and the low cost model can be scaled up rapidly to cover ever more beneficiaries. In contrast, alternative approaches to financial inclusion - for example, the targeted lending programmes - are seen as money losing propositions, sustained only with coercion from above. Of course, gold loans have a limitation that benefits go only to those who own gold. But even this is helpful to the larger cause because resources, and more focussed attention, can now be diverted to the section that owns no gold, in other words, the most vulnerable of the lot. Shri. Vaidyavachaspathy N.K. Padmanabhan Vaidyar Sri. N.K. Padmanabhan Vaidyar passed away on the 25th of August, 2013. Sri. N.K. Padmanabhan Vaidyar was born as the eldest son of Sri Kunchan Panicker into a well known traditional ayurvedic family ‘Vallat’, from Cherthala. Vaidyar completed his Sanskrit studies from Charamangalam Sanskrit High school and completed vaidya education under the Gurukula tradition from Sri. N.K. Pilla Vaidyar . He had spent the initial years of his life learning the principles or yogas of Ayurveda and their applications, from manuscripts that were handed down by the great masters. He established a clinic under the name New Udaya Pharmacy in the year 1960 and started his practice in Ernakulam at Kadavanthra junction. Vaidyar obtained Certificate of competence in ‘Vishavaidya ’ , in the year 1974 from Government of Kerala. Kamilari – which was developed in 1960s , it ameliorated many lapsing livers. Liver is the master organ in the body According to Vaidyar, “if the liver is healthy no virus or any other foreign body affects the immune system . The highly reputed quality of NUPAL products is the result of sincere efforts and high standards of its very sophisticated quality control department, one of its kind in South India with an investment of over 2 Crores. The technical persons keep a constant surveillance of all production activities starting with the receipt of raw materials right to the final stages of packing, storage & dispatch. Strict in plant control inspections, The Quality control department is equipped with necessary instruments as well as qualified and experienced staff. NUPAL has plans to start a very sophisticated medicine manufacturing unit under WHO CGMP specifications. Construction has already started and the prestigious project will be completed within a year or two. He had a strong passion to collect medicinal herbs from almost all parts of the country and he had taken the initiative to plant some medicinal herbs in the Ernakulam Collectorate and he used to personally visits the herbal garden in the collectorate and guide the gardener with his valuable suggestions for maintaining the same. NUPAL has invested more than 2 crore rupees in Quality Control and Research & Development (R&D) and is well equipped with modern sophisticated instruments like: • HPTLC of Camag Switzerland with photo documentation with densitometry measurements. • HPLC of Thermo USA (Quaternary gradient with PDA detector), • Gas Chromatography for testing residual solvents, Pesticide residues, Volatile oils etc., • Atomic Absorption spectrophotometer with Hydride generator for testing Heavy metals and Trace metals • Micro wave digestion systems etc., • Rotary Vacuum Evaporator • and is engaged in various research activities spanning all the areas of Ayurvedic research. operative Hospital society Ltd [Indira Gandhi Co-Operative Hospital] etc. Sri. N.K. Padmanabhan Vaidyar passed away on the 25th of August, 2013. He leaves behind a great tradition and knowledge for the humanity. He was a person with high ethical values and passion for work. It is always right to hope that his life will be inspiration and model for generations to come. and place of transaction, it equally poses challenges also , if adequate care is not taken while transacting. The number and quantum of online financial frauds have been steadily increasing. In almost all the cases it has been the lapses on the part of the customers that has helped perpetuate the crime. When you physically deal with a bank , bank takes care of a whole lot of your security requirements . But when dealing online the responsibility of securing the account and transactions becomes very much on the customers. Here are certain tips that will help you secure your online transaction. Never respond to emails that request personal information The first and foremost thing you should always bear in mind while transacting online is that your bank would never ask for your personal details through an email. The bank would also not ask for your password through any other means, phone, fax or in-persons. Even if any of the bank personnel asks you for your password, please do not disclose it and report about the incident immediately to the higher officials of the Bank. changing the passwords often . This will helps in protecting your account even if inadvertently you may have disclosed the password to someone. Limit the amount of personal information you provide on social networking sites. The more information you post, the easier it may be for a criminal to use that information to steal your identity, access your data, or commit other crimes. For the first time you login to your internet banking account, you will have to use the password provided by the bank. However, you should change this password immediately in order to keep your account safe. Never let anyone know your PINS or password and never write them down or use your mobile device to store sensitive personal information or bank account numbers. Also remember never to use the same password for two online accounts. typing passwords on unknown PCs. It is equally important that you disconnect the internet connection when you are not using internet. browser tabs and applications closed. If you open a malware infected email while you're banking, a hacker may be able to capture your keystrokes as you log into your bank or they might take over your session entirely. It is a safer to type your bank URL in the address bar of the browser than clicking on links given in an email. Before submitting your bank details or other sensitive information, if the address bar is visible ensure that the URL starts with 'https://' ('s' for secured) rather that the usual 'http://'. If the address bar is not visible, look for a lock icon on the browser's status bar. better that you clear your browser cache after you have completed the transaction. Setting up activity notification Many banks have been providing SMS or e-mail alerts to customers as when any transaction in the account happens. Such alerts help in obtaining information of fraudulent transactions immediately. Most of the banks offer this facility free . Even if the same is chargeable , this facility provided by banks should be used. Customers should also check the account after making any transaction online. This will help to ensure that the right amount has been deducted from the account. Entrepreneurship Dr. Thomas Nechupadam heads Metanoeo, a total transformation/ grooming company that has been the by word for grooming and dressing, personality enhancement and Social/Corporate Etiquette for many pageants including Ms. South India and Mannapuram Ms. Queen of India contest 2012.
uccessful entrepreneurs share a lot of qualities. In fact it is this quality that makes them successful. There are certainly a lot of qualities that makes a person successful that includes a hardworking mentality, integrity etc. The irony with these qualities is that everybody knows it and values it, but when it comes to real life situation it is very hard to practise. Entrepreneurs are a different breed. Most of them are highly inspired and perform to their very best. It is work of some great entrepreneurs that made our world more lively and advanced. We were talking about qualities, so I am listing down five qualities that almost all entrepreneurs share. So it can be considered as a checklist, if you are aspiring to start a venture. To be the Best Entrepreneurs always aspire to become the best and deliver the very best. Entrepreneurs like a challenge. Entrepreneurship includes continues learning and sharpening your skills. Entrepreneurs excel in every field of the business; a successful entrepreneur will know his business inside out. They are experts in marketing, they network a lot. They know each and every process in their firm, and can easily substitute anyone in case of an emergency. Passion Passion for work is simple terms means love your work. But it is more that, as an entrepreneur you will need extreme levels of commitment and dedication to your work. If you just interested about your work, you will not be able to survive the highs and lows of the business. Find out, whether you are really passionate about the work before you venture out to be an entrepreneur. Open to new ideas As an entrepreneur you are continuous learner, there is always something to learn from others. Entrepreneurs are always open to new ideas and they are all flexible. They continuously adapt the best practises from all over the world. Futuristic Successful entrepreneurs are always thinking ahead, they are focussed on their goal and on improving their business. Their goals also keeps changing for good, the entrepreneur is the one who will find opportunities and grab them at the first chance. Idea Creator The successful entrepreneur will always have a flow of ideas in his head. He will be always thinking ahead. He churns this new idea into new business opportunities. The list is not exhaustive but very basic; but these are the fundamentals. The design even though some six years old still looks good. It is a rare to see a company keeping the design rather unchanged. The dashboard design is very much driver oriented, the interior of the Fiat Linea comes with two-tone wrapped dashboard that houses the instrument panel, centre AC vents, audio system and a glove box at front row. The Linea T-Jet has a slight turbo lag below 1500 RPM because once the turbo spools in full form and flow, it gives you a gentle push in your seat at around 2000 RPM and the Linea T-Jet takes off. although far from class leading, offers decent amount of knee room. The Linea has got a big boot space of 500 Litres. Safety options of Fiat Linea includes Dual front Airbags with two stage deployment, ABS along with EBD, ESP help providing more support while driving, this car allows stable traction control with the help of brakes and engine control. Another safety provision include inertia switch FPS (Fire Protection System). FPS system prevents the car from flow of fuel in engine at the time of emergencies. Apart from that, the Fiat Linea has been equipped with front disc brakes and rear drum brakes, engine immobiliser with rolling code, 3 safety headrests, Double Crank Prevention system, Programmable speed limit indicator, Programmable follow me headlights, Digital door open indicator with exact door open indicator, etc. The new Fiat Linea T Jet comes powered by a 1.4 litres, 16-valve, 1368cc, turbo-charged petrol engine that is also Euro V and BS IV compliant. The C plus segment Linea T Jet is available in two variants i.e. The Linea T-jet is dream car when it comes to handling; it inspires a lot of confidence when doing high speed cornering. The Ride quality is excellent. reduced from 5.55-metres to 5.4metres still makes it difficult to manoeuvre through tight spots. Braking performance is splendid and the all round disc brakes work well to stop the T-Jet firmly in its tracks. NVH levels are good although wind noise is on the higher side at high speeds. Fiat claims every second Linea sold is powered by a petrol engine and most of those petrol powered cars sold are powered by the T-Jet motor. The Linea T-Jet is not only the most frugal petrol Fiat in India but the most fun too. The 2013 Fiat Linea T-Jet is a bit more practical with more variants available and more features on offer. The Linea T-Jet Active is priced at 8.99 lakhs while the Dynamic variant is priced at Rs. 9.97 lakh and Emotion variant costs Rs. 10.44 lakhs and at this price point, no sedan that comes close to offering the levels of equipment, performance and fun as the Linea. The advice to do what you love has become a bit of a clichĂŠ. Everyone says, "Find your passion." But that's easier said than done. Being an entrepreneur demands commitment and dedication -- more than most jobs do, I'd argue. If you're ambivalent or mildly enthused about your product or service, that's not going to sustain you through the highs and lows that will inevitably occur. If you find something you love enough to want to share it with others, that love will fuel and give you purpose. everal studies show that a well-designed office is one of the easiest and most cost-effective ways to retain workers and make them more productive. General Electric, Microsoft, and major West Coast insurer Group Health are just a handful of major organizations reaping the benefits of smart, worker-oriented designs. customers will see it and how your employees will use it. Choosing the right office space, whether for rent or purchase, for your business will have a big impact on how well your business runs. Here are a few tips that will help you choose the right space for your business. Utilizing a real estate professional who specializes in office space, an office tenant representative, will reduce the amount of work substantially. A professional will be familiar with a variety of styles of office space around the area. When know what you are looking for and can communicate these needs clearly they will be able to show you properties that meet your needs. Location This is a very old adage that the most important aspect of an office is its location. This is particularly true if the business requires foot traffic. Think about who your customers are and narrow down the choices. Assess the Building It is important to look at the building as a whole. Many commercial buildings will publicize upgrades, but won't talk about repairs. Review the Lease The final step is to review the lease very carefully before signing anything. Make sure you understand what you are responsible for and what the landlord is responsible for. It is a good idea to have a lawyer review the document. Protect your hair from sun, wind and rains. Exposure to weather conditions like excessive sun, heat, dirt etc, will add to your hair woes. This can lead to dirt build up, drying out of hair and scalp and increased chances to infections on the scalp. Cover your hair with an umbrella or a hat where you are outdoors. Avoid using heat on your hair. Heat further strips the moisture content from our hair making it dry and frizzy. When over used, it can also burn your hair. Wet hair breaks easily and you have to take special care. Be careful when you wash your hair and shampooing. Avoid brushing immediately after a shower. If you have comb to then use a shower comb instead. Always use a moisturizing conditioner after every wash. This is very important because lack of will leave your hair fizzy. Conditioning needs to be done right. Conditioners are formulated to seal in the moisture content in the shaft of the hair. They are not meant for the scalp. begin conditioning about 2 inches away from your scalp. Too much conditioner on the scalp will only make your scalp oily. prestigious Award. The Awardees include Mr. V P Nandakumar of Manappuram Finance, Mr. Joy Alukkas and Mr. M A Yusuf Ali who heads the EMKE Group. Since the award is highly exclusive, very high parameters set to select the winners. The parameters require a business size of 5000 Crores or more. Even though it a business achievement award, it is not just about the money, the nominees corporate social responsibility (CSR) activities are considered highly for the Award. Elite-India club is a guild of the MBA Awardees, where only one person will be admitted to the club in a year. The club will further reinstate the importance of such an Award. Since it will be an association of the Awardees, the Club will be highly exclusive. The Club will be a rendezvous of this great business minds and their ideas which in turn can be used for the social good. Elite-India club as a premier club of the Malayalee Business Achievers will be richest club among the Malayalee Business Fraternity. The club also will one of its kind and one of the riches club in India considering the members wealth. The Elite-India club will be thus an aspiration for every entrepreneur, as it stands for outstanding achievement, excellence in business and a big heart for social causes. The Elite- India Club was formed as part of Mr. Ajit Raviâ&#x20AC;&#x2122;s vision to form an elite club for Malayalee entrepreneurs and businessmen. Confident Group, is a rapidly thriving conglomerate, headquartered in Bangalore with operations in Kochi, Trivandrum, Thrissur, Calicut, Dubai and Overseas. Confident Group is diversified into six verticals, namelyInfrastructure, Hospitality, Aviation, Entertainment, Education and Health Care. Pegasus Pegasus is a highly successful Event Management Company, which organizes famous pageants like Miss South India and Miss Queen of India. MBA Award is earnest attempt by Mr. Ajit Ravi Pegasus, to bring into limelight the achievements and services of the business fraternity, which most of the time goes unnoticed. TIPS Be Entertaining Your presentation should be entertaining and informative. The presentation should appeal to the audience. It should be prepared well and executed well. Some kind of innovation and humour will make it more appealing. The Pace The pace of the presentation should not be fast or too slow. But you should also be flexible to speed up or slow down your presentation according to the need of the audience. Eye Contact Match eye contact with everyone in the room. I’ve also heard from salespeople that you shouldn’t focus all your attention on the decision maker since secretaries and assistants in the room may hold persuasive sway over their boss. 15 Word Summary Can you summarize your idea in fifteen words? If not, rewrite it and try again. Speaking is an inefficient medium for communicating information, so know what the important fifteen words are so they can be repeated. 10-20-30 Rule This is a slideshow rule offered by Guy Kawasaki. This rule states that a powerpoint slide should have no more than 10 slides, last no longer than 20 minutes and have no text less than 30 point font. Speeches are about Stories If your presentation is going to be a longer one, explain your points through short stories, quips and anecdotes. Great speakers know how to use a story to create an emotional connection between ideas for the audience. Project Your Voice Nothing is worse than a speaker you can’t hear. Even in the high-tech world of microphones and amplifiers, you need to be heard. Projecting your voice doesn’t mean yelling, rather standing up straight and letting your voice resonate on the air in your lungs rather than in the throat to produce a clearer sound. World Hunt 2013 MBA Award is a prestigious award given to a business man with an asset base of 5,000 crore and a big heart for social causes. Do Your Homework Obtain the maximum information and analyze it well before you invest. This will give you a real world insight about your investments. Diversify Don't put all your money in one stock. Also, buy fixed income securities and stocks. Don't pick only one type of investment. Set Goals & Limits Determine the price (high target price or low stop-loss price) at which you're willing to sell. Analyze interest rates to decide what return you want. Don't Gamble The less you can afford a loss, the more conservative you should be in your choice of investments. Don't Be Greedy Don't expect your broker to recommend stocks that will double in value within a few months. If you do have a stock that goes up considerably. Invest For the Long-Term Company stock prices will fluctuate, sometimes unfavourably, in the short-term. Invest for the long-term, but keep your current financial needs in mind. You never know when you might need some of that money. Avoid Acting on Impulse Stick to your plan and donâ&#x20AC;&#x2122;t buy on impulse. Impulse buying is most sure to end in a loss. Go For Value Investing Undervalued stocks will help create the most growth in your portfolio. Look for bonds of companies that are out of favour too. They should be selling at a deep discount. South Africa is one of the most unequal countries in the world where opulence and severe poverty can often be observed together. pandemic, and poverty levels appear to be on the increase. South Africa boasts a well-developed infrastructure and has all the modern amenities and technologies, much of it developed during the years of white minority rule. The government is stable, although corruption is common. The government and the primary political parties generally have a high level of respect for democratic institutions and human rights. zero; summers can be very hot, in excess of 35째Celsius (95째F) in some places. The South African Weather Service provides up to date weather information, forecasts and radar imaging. National Parks The Kruger National Park The Kruger National Park (KNP) lies in the north-east of South Africa and runs along the border of Mozambique in the east, Zimbabwe in the north, and the southern border is the Crocodile River. The park covers 20,000 square kilometres and is divided in 14 different eco-zones, each supporting different wildlife. It is one of the main attractions of South Africa and it is considered the flagship of South African National Parks (SANParks). The rainy season for most of the country is in the summer, except in the Western Cape where the rains come in the winter. Kgalagadi Transfrontier Park in the heart of the Kalahari desert with wide open spaces and hordes of games including the majestic 'Gemsbok'. This is the first park in Africa to cross political borders. There are also a large number of smaller parks, like the HluhluweUmfolozi Park, Addo Elephant National Park, Pilanesberg National Park or the iSimangaliso Wetland Park. UNESCO World Heritage Sites The Cradle of Humankind, near Johannesburg is a must see for anyone interested in where it all started. A large collection of caves rich in hominid and advanced ape fossils. Robin Island just off the coast from Cape Town where Nelson Mandela was imprisoned for many years. The Cape Floral Region in the Western Cape Simangaliso Wetland Park, Mapungubwe Kingdom, in Limpopo Ukhahlamba Drakensberg Park, for its landscape, biodiversity and rock art. Vredefort Dome, remnants of the largest and oldest meteorite impact crater. The Cradle of Humankind, near Johannesburg is a must see for anyone interested in where it all started. A large collection of caves rich in hominid and advanced ape fossils. valuables such as jewellery and expensive devices in your main luggage if you can and place them in your hand luggage. Know your bargaining position In every negotiation there is a strong position and a weak position and someone will be in the strong position and the other will be the weak position. In most cases the side that wants more will give up more because they cannot afford to lose the deal. Know how the other side perceives its position. Before entering into a negotiation, you should know how the other side perceive its position. If your negotiating position isn't great but you see the other side is worried about losing the deal, you can't go wrong by coming on strong and playing to the other side's fears. Assess your bargaining style Your bargaining style can be either passive or aggressive. People who are naturally aggressive tend to win more, because people are afraid of them and their behaviour. You should be mentally ready to be aggressive before you sit on a bargaining table. If you are ready then see what you get out of the bargaining table. There are two kinds of goals in a negotiation exercise. The goals you cannot miss and goals you can miss. You can call it a deal point and a trade point. Deals points are something you cannot miss and trade points are something you can afford to live without. (Paperback) Every leader finds success by application of certain principles that stand by him. By learning from the great leaders and applying the same principles they adopted, you can achieve similar success in your life and career. This book looks at the life of one of the greatest leaders that arose from Maharashtra and impacted India. So what made Shivaji Maharaj able to lead a team of 2,00,000 when most corporate houses today would have much trouble handling even a tenth of that as a workforce. Discover the secrets of his leadership style and what made him a leader that the masses wanted to follow. (Paperback) Chanakya, the most owerful strategist of 4th Century BC, documented his ideas on management, in the Arthashastra. In the resent book, the author simlifies these age-old formulae for success in todays cororate world. Cororate Chanakya on Management alies Chanakyas wisdom across a host of areas including recruitment and emloyee management, finance and accounting, time management, the role of team work and organisational strategy. Gain from this guide and discover the Chanakya in you How to Analise Financial Statements focuses on Financial Statements, which are timely account of the financial situation of an enterprise. The book covers: Overview and importance of financial statements Steps involved in analyzing financial statements Different type of analyses Comparison using financial ratios Solved illustrations and exercises Using simple language and short stories to set the stage and tone for theoretical discussions, this book helps non-finance executives make sense of jargon-laden financial statements of their firms. (Paperback) From this hugely influential, internationally bestselling author - a new book focussing on the most effective way to resolve conflict. In any conflict, the First Alternative is my way, and the Second Alternative is your way. The fight always boils down to a question of whose way is better. This book presents a new and practical, but incredibly effective and eye-opening, way to reachresolution through using the 'Third Alternative'. The Third Alternative moves beyond your way or my way to a higher and better way - one that allows both parties to emerge from debate or even heated conflict in a far better place than either had envisioned. With the Third Alternative, nobody has to give up anything, and everyone wins. The Third Alternative represents a departure from material on conflict resolution, negotiation and mediation; the book represents a new way of thinking that will be embraced not only by the many fans that have flocked to Covey's prior books, but also by anyone who is seeking resolution in their professional or personal lives. (Paperback) When people hear the term, Financial Planning, they often confuse it with investment planning, portfolio management or tax planning. Some are immediately put off, as they simply do not have time to plan. They think of the process as complex and time-consuming; in fact, most believe they should think of a financial plan once they have enough wealth. There are many such myths about financial planning and its important to understand what financial planning really is. Any decision about money impacts your overall finances. In fact, deciding not to invest or not to plan is also a decision. Any decision that you take about money and that has an impact on your overall financial situation is financial planning. The irony is that most people do financial planning unknowingly and in an unstructured manner, whether it is buying insurance policies, or stocks, or investing in real estate or taking a loan. (Paperback) For those who have forever grappled with the scores of elements of business, economics and finance, this book EVERYTHING YOU WANTED TO KNOW ABOUT BUSINESS AND ECONOMICS by Rommel Rodrigues comes as an illuminating encyclopaedia which will step-bystep teach you almost every component of complexly arranged terms that is commonly used and employed. Starting from a brief history of genesis of economic principals, economy of India and extensively covering topics like budget, trade & industry, stock markets, financial markets, investments, banks & savings, the book takes you through the entire lexicon of this domain in a very easy & light read mode. Laced with examples at every step for easy understanding of what looks like complex terminologies, which you can refer for authoritative facts, the book also doles out tricks & techniques for better investing your hard earned money in the variety of options that is well explained in a fashion which even the most novice of us will be able to comprehend. Interesting crispy factoids within the chapters is bound to keep you enthralled as you progress from learning one interesting topic to another. aperless is a tablet drawing app that also lets you sketch and paint with water colours, feather, pencil and brushes. The app adds precision to your images with a customisable engine so you can set line thickness, size, opacity and smoothing. As well as the ability to share your creations via Facebook, you can also save images as PNG files. his basic sketching app features 11 brushes, colour picker and eraser, and lets you share your doodles via email and MMS. It's free to download, or you can splash out a few dollars for Sketcher Pro and enjoy additional features such as adjustable canvas size and the ability to pan/zoom. his free painting app focusing on natural brush effects and smooth, pleasant workflow, Serious Paint boasts natural media brushes that simulate proper bristles and blending. One of its niftiest features is Colour Sweep, a configurable swatch of colour that you can set up and then access with a simple gesture while drawing. hen Photoshop finally came to mobile devices (it was first on Android, before hitting iPad) there was a collective cheer from Photoshop users everywhere - as it meant, via Creative Cloud, you could now start work in the office, carry on out and about, and continue where you left off at your desk (of course you can change that order if you wish!). ilter effects aren’t exactly a new thing, but Paper Camera takes a different approach to the post effects found in the likes of Instagram. What does it do? Well, it displays effects in real time on your camera as you’re using it. There are some neat effects on offer - including cartoon, half tone and sketch. It’s not a serious tool for serious work - more a toy - but it's a worthy entrant in our best Android apps. antone knows a thing or two about colour - and this app, as seen on iOS devices - enables you to create colour palettes on the move, extracting Pantone colours from images and more. One of the best things about the app is being able to quickly look up the reference number of a Pantone colour if you’re out and about. You can also, like in Kuler, export palettes for use in Creative Suite (and QuarkXPress docs). acebook is for weekends, Twitter is for weekdays if youâ&#x20AC;&#x2122;re posting on Facebook during the week, youâ&#x20AC;&#x2122;ll get the biggest reaction between 6 and 9 p.m. When people are home from work. This is commonsense that in order to get some attraction, you should look for the time people will be logging into Facebook. Delete posts If your posts are fetching immediate response, delete the post and get in sometime later. Even though you don’t how exactly facebook algorithm works; it is a known fact that posts will some quick likes will have higher views. Ask Questions Questions are a quick way to rack up comments. Questions may range from intesting to funny and can be something serious also. Questions are sure to get some answers. Pace your Posts Space your posts so they’re coming every three or four days. That’s enough so people know you’re in the community but not so much that you’re annoying. Occasionally, I’ll go a couple weeks without posting. A celebrity will help It’s stupid but it’s true. Get a photo of yourself alongside George Clooney or even Pauly Shore and you’re good for a quick 50 likes. Same goes for you next to some famous location. You “holding up” the Eiffel Tower or kicking it on The Great Wall — that’s comment rocket fuel right there. Spice your photos I tend to sweeten photos before uploading to Facebook. That giant chili dog you’re about to eat will just look better if you’ve blurred and antiqued it in all the right ways first. Variety Helps During major events posts tend to sound alike. Don’t be just another nattering voice on my feed. Give me a link to a cool 70s video or a link to some new app that’s truly rocking your world or maybe a photo of your cat in a tiny bunny costume.